I asked Marcus to promise not to tell me where he was planning to take me out for my birthday, mainly because it's really hard to surprise me. Even if I stay calm and nonchalant, said surprise plans always get foiled because I notice a small detail or someone slips up. Marcus did a great job of keeping the cat in the bag, because I had no idea up until the night of my birthday on Saturday. He nearly spilled the beans right before we got there, but he was such a sport, keeping it all under wraps! We pulled up right to The Four Seasons restaurant when he said, "We're here!" Ah, it was such a lovely surprise--I was so excited when I realized where we were! 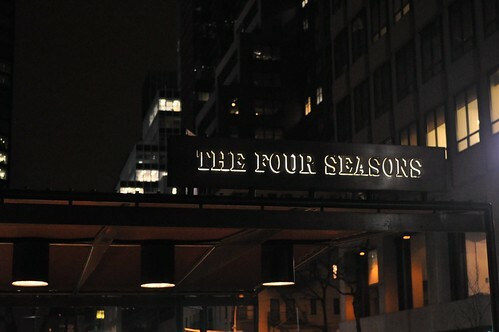 Not to be mixed up with The Four Seasons Hotel, The Four Seasons is located inside the Seagram Building and marked many firsts in the hospitality industry. It has been credited with introducing the idea of seasonally-changing menus to America as well as the first American restaurant to serve American wine (outside of California). 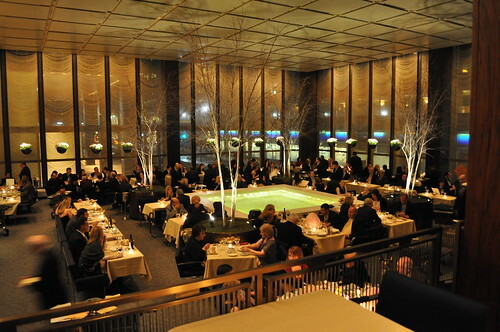 Also, another interesting fact is the restaurant's interior, designed by the building's architects Mies van der Rohe and Philip Johnson, has remained almost unchanged since construction in 1959. Additionally, The Four Seasons has had (thanks to Luxist for background) many a great modern artist grace its five dining room walls with their masterpieces, including works by Roy Lichtenstein, Juan Miró, Pablo Picasso, Jackson Pollock, Robert Rauschenberg and Frank Stella. In fact, the furnishings in these dining rooms were created by Charles Eames, Garth and Ada Louise Huxtable, Eero Saarinen, as well as Mies van der Rohe. Incidentally, eighteen pieces of service-ware along with a selection of furnishings are in the permanent collection of the Museum of Modern Art. Marcus made reservations specifically in the Pool Room, and we were seated in the Pool Room Terrace, with this view of the pool at the center of the main dining area of the Pool Room. A very airy and romantic feel to it. The ambiance is subdued, with some light chatter in the background. This is the view from our table of the current artwork displayed on the walls. 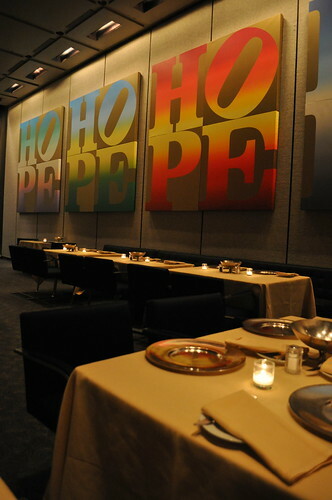 It is a series of four canvases, entitled "The Four Seasons of Hope," uniquely silk-screened onto canvas with ink by artist Robert Indiana. The restaurant has these draperies made from anodized aluminum chains that hang in downward pointing curves on the windows. I assume its lightweight nature causes them to swing back and forth, creating this beautiful rippling effect along the windows. Here is The Four Seasons restaurant menu. I really like that there is no text written to say The Four Seasons, but rather the four unique, graphic trees (the restaurant's prized logo) to represent each of the year's seasons. Bread bowl! Marcus was a little obsessed with the miniature croissants, mainly because they were so buttery, light, and crispy--everything you want in an ideal croissant. As appetizers, Marcus and I selected and shared two dishes. This first one was the tuna-sea urchin ravioli with a diver scallop tartare, caviar, and chervil crème fraîche. The ravioli here wasn't the traditional pasta kind. 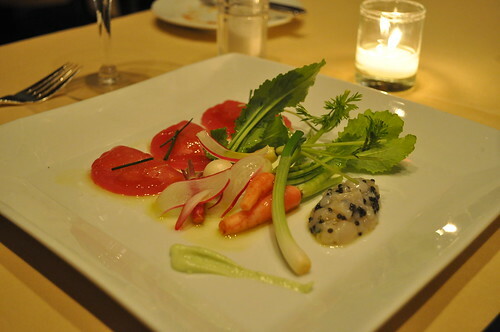 It used raw tuna as the ravioli skin, filling it with fresh sea urchin (see three raviolis on the left). 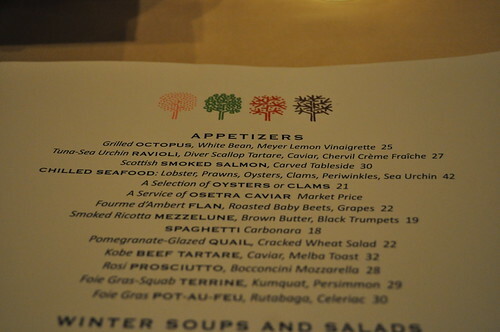 The diver scallop tartare was over to the right, mixed in with caviar. The chervil crème fraîche is the light green sauce underneath the raviolis and the assorted root vegetables and the wasabi mustard sauce was placed on the bottom right corner in an artistic way. I really enjoyed this dish (as did Marcus)--I would have never thought to make raviolis using tuna as the skin. I'm impressed at how they were able to do so! They were delicate and soft, melting in my mouth with its heated moisture taking over as I chewed. The diver scallop tartare was very light and done well, too, with a clean taste and an added saltiness from the caviar. We also shared the grilled octopus with white beans and Meyer lemon vinaigrette. Marcus liked this dish best, him being a squid/octopus fanatic. 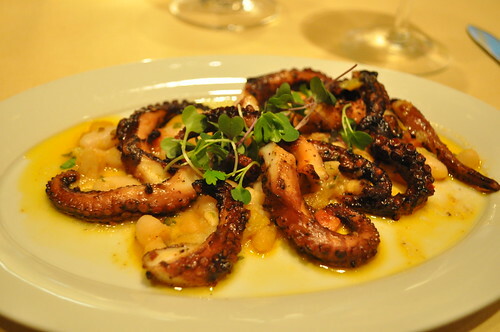 The grilled flavor of the octopus gave the dish an extra depth of flavor along with the tartness of the lemon vinaigrette as well as with the soft, hearty texture of the white beans. The octopus itself was very tender and the right balance of chewiness when it comes to the culinary preparation of mollusks (such a funny word, by the way). Marcus went with a medium-rare sirloin steak with bone marrow tempura in an onion-beef broth. The broth had so much depth and overall taste, enhancing the flavors of the sirloin steak, with its already tender texture. The tempura batter enveloping the bone marrow was pretty good, but the bone marrow could do fabulously on its own. Rich, jelly-like (in the way where it melts savoringly in your mouth), and fried to perfection, the bone marrow matched well with the broth, too. There were assorted vegetables included as well. 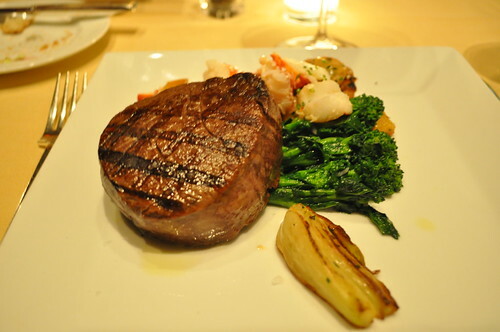 I had a medium-rare filet mignon with lobster hash and béarnaise (a sauce made from clarified butter emulsified in egg yolks and flavored with herbs). It was also served with a side of broccoli rabe. The filet was very easy to cut, which was juicy and warm through the middle with a hint of red. Surprisingly, the béarnaise was my favorite part of this dish. 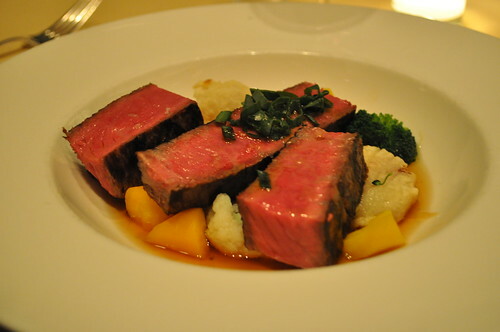 It paired very well with the filet, adding an extra creaminess to its hearty and meaty texture and taste. The broccoli rabe was a little bit overcooked and too bitter to my liking. I wasn't really crazy about the potatoes in the lobster hash--it seemed over-seasoned and the potatoes were slightly undercooked. It didn't seem to bother me much, though. The béarnaise made me forget what I didn't like about this dish and just enjoyed the filet as it was. The lobster chunks in the hash were great, too. If I could make changes to this dish, it would be to make this a "surf-and-turf" dish, and instead of lobster hash, there'd be a lobster tail, lightly seasoned in butter. Nonetheless, I enjoyed this main course very much. Béarnaise all the way! As a note on the bottom of the dinner menu, the restaurant suggests that if you plan to order any soufflés at the end of the meal, you should order it at the beginning of the meal. 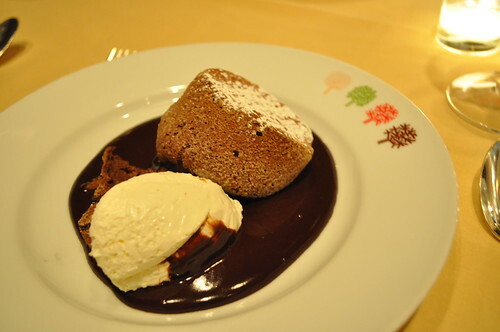 So we decided to order the Four Seasons chocolate soufflé which is served with freshly whipped cream and chocolate sauce. The soufflé was served right out of the oven--we could see the steam coming out from its center as we cut into it! Warm, moist, and not at all heavy, the chocolate soufflé was exquisite--I could barely remember the last time I had such an amazing soufflé! Though, what confused me was why it was served outside of the soufflé cup. Maybe for presentation? No idea! Hmmm, when I come to think about it, the last time I had a really good soufflé was a pistachio soufflé at France Origine (also called FR.OG at the time) back in 2007. But as with many neighborhood gems of a restaurant, it has been closed for quite some time now. Anyways, this made up for my major lacking of a great tasting soufflé to remind me how much I love having them. It also reminds me that I have to get cracking on learning how to make a solid soufflé (excuse my pun, haha)! Me and Marcus at The Four Seasons. I just wanted to thank Marcus for such a wonderful birthday evening as well as for all the lovely edible surprises he planned out during the day (i.e., lunch at Isabella's, soy maté latés from Argo Tea, and a surprise dessert--tiramisu and cannolis from Ferrara's--after this incredible meal)! Thank you for inducing my stomach into a perpetual food coma throughout the birthday girl's day on Saturday. 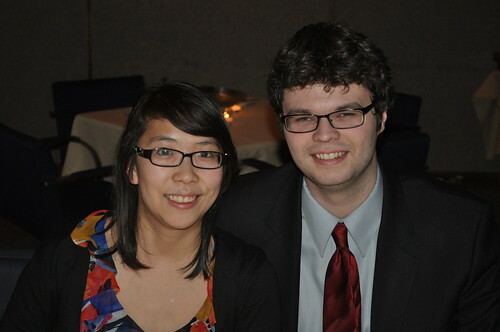 I have, arguably, the best boyfriend a girl could ask for--I love you :D! 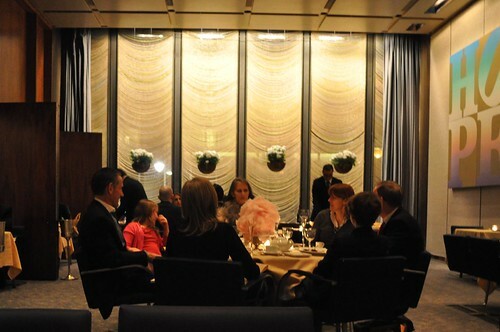 Findings: If you want to sit down and have an iconic New York City dinner, making reservations at The Four Seasons will surely give you that experience. The architecture and the interior design of the restaurant's space in the The Pool Room is simply astounding. The same design that was meant for the restaurant during its inception in 1959 still stands as it is today. Plus, the restaurant's collection of admirable Modern art (ranging from Picasso to Pollock) adds to the overall experience! There is so much history just in the room where you'll be seated, and the view of the pool is gorgeous. The atmosphere is quiet and very romantic--the perfect place to celebrate a big milestone. And another plus is that the items on the menu are seasonally creative and constantly changing with the seasons (thus, its name). You'll expect nothing less than the best when your courses are served to you. 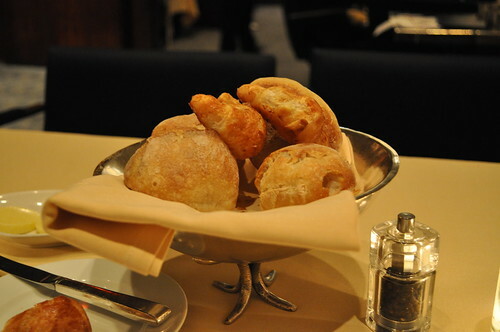 Price point: $25-27 for each appetizer; $55-56 for each main course; $15 for dessert.